I love food. I have always loved food. Since very young I have been taught to enjoy inhale food, especially high caloric, high fat options. I am an addict, and like a druggie grasping for a needle, pulling tightly on the elastic wrapped around my upper arm, desperate for quick release, a familiar euphoric state, just a moment of relief… I wildly search for my next fix. I have been should be preparing a book proposal. I have hundreds of short stories that I need to find a common ground, a thread of similarity, an iota of connection so I can organize them into a book that actually makes sense… by next week. I have a publisher meeting with three different editors in 10 days, and I have no passion. No drive. No real hunger. I sit down at my computer and look over these amazing stories God has given me, and I sort, shuffle, sift, and sort again. I take some from one pile and shift to another. I get up, walk to the kitchen to clear my head, open the fridge and close it again, stretch a bit, and return to the laptop only to shift things back to original positions. I can’t find my way. I can’t feel God’s leading or hear His voice. My head falls into my palms as tears fall down my face. I cry out for help, desperate for answers. I push my chair back and head into the kitchen again. I feel the cool air on my face and neck as I stand before the open freezer, looking for something, anything to move this writer’s block. I grab a spoon and dig in. No need for a bowl. 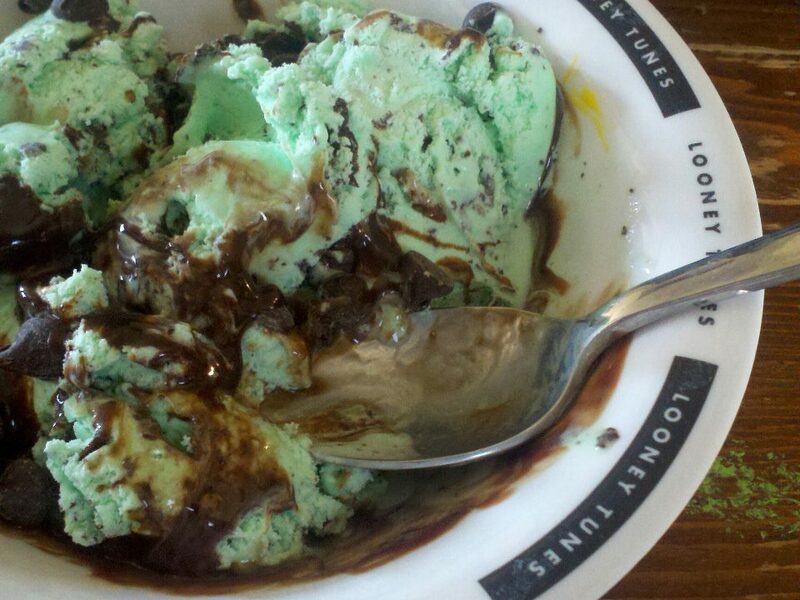 I close my eyes as the creamy, cool, minty sweetness embraces my tongue and runs lazily down my throat. A delightful moan passes my lips and I let out a contented sigh. I put the gallon back into its frozen abode and head back to the computer. I sit down, take a deep pacified breath, shuffle a few more stories, write a couple sentences, and my mind wanders. I shake the thought off, and return my gaze to the computer screen unable to focus. I start shifting stories again, exasperated huffs filling the room while I struggle with the layout. I wriggle uncomfortably in my chair and exhale frustratingly. I look away from the screen, close my eyes and irritatingly punch keys, trying to write. My mind whirls as I muddle through words. It all comes to a head and I stop typing. I push back from the desk and move quickly toward the place I know I can find comfort, satisfaction, answers. I yank open the freezer and grab my next fix. Isn’t that just how our adversary wants us? Desperate; grasping and clawing the air, trying to find delight and joy, comfort and peace, justification and answers in anything other than the One who can truly supply it? Yesterday I saw how easily I have allowed the devil to steal my focus, pillage my passion, and heist my devotion. I have allowed him to seduce me and take my eyes off of Jesus, and I hadn’t even noticed. Instead of finding satisfaction in my God, I sought out food. Instead of finding delight and truth in His Word, I pursued fleeting joy. Instead of true comfort and answers, I chased empty promises. thanks for sharing this very relatable post, I think a lot of people go through this. I used to do a lot of wellness coaching before I started my life coaching practice and I can’t tell you how many people were dealing with the same things. Stress management was always a big factor that seemed to help. Anyway good luck and everything will truly work out in the end. I agree…I have many friends who struggle, as I do, with emotional/stressful eating. Such a difficult vice…especially because we can’t go without eating…it will ever be part of our lives!! Thanks for the comment, the visit, and the encouragement!! You’re very welcome. I think sometimes we battle with ourselves about the eating part of stress eating, when sometimes what we really need to do is nurture ourselves and take care of the stress part. You’re absolutely right!! Thanks again so much!! In my house, I learned to eat fast or I wouldn’t get seconds! Needless to say, I became a greedy overeater. This has been one of the greatest struggles of my life. God told me at 19 what to do. I did it … for 2 years. Then again at 34, God spoke to me. And it has been a continual battle to yield to His will since then. Now I look back and think, “If ONLY I had done what God said … I wouldn’t be in this mess now at the age of 52!” So, I want to pray for you and encourage you, my sister, in your quest to find your satisfaction, delight, and comfort in God instead of food. I’m with ya on that one!